The Faculty Activity Report and the Scholarly Activities Report have been updated to increase the efficiency of their respective database queries. The improvements to the formula will increase speeds when trying to pull reports. Larger databases should note greater improvements. 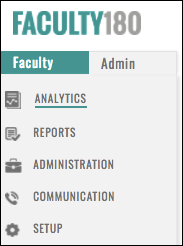 Data analytics tools can be added to the dashboards of administrator users at any institution using Interfolios Faculty180. This complements and extends Faculty180s existing faculty dashboard functionality, which is disabled by default but can be enabled on request to Interfolio. 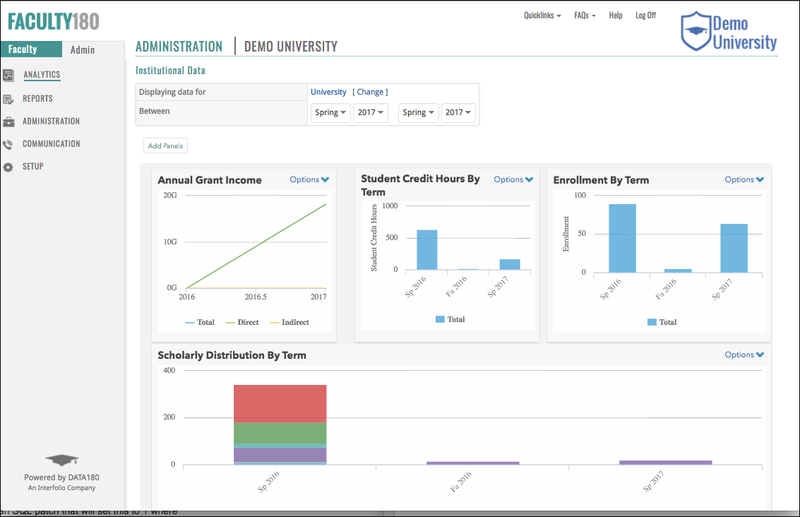 The new dashboard for administrators allows users with appropriate permissions to see aggregate data on course enrollments, scholarly contribution production, and grant income at the academic unit, college/school/division, or discipline levels. In the Admin tab, weve introduced a new dedicated Analytics link to house this feature (as it grows). The Analytics feature automatically turns raw data stored in Faculty180 into visual charts/graphs. This initial release does not offer drill-down capabilities, but that feature is planned for the future. If youd like to enable Analytics for users at your institution, please reach out to your Client Services Manager (Melba or Chris). NOTE: The following features appear only if analytics are enabled in your production database based on a request to the Interfolio team. Weve added an Analytics button to the sidebar on the Admin tab. When an Administrator navigates to the Analytics page from the sidebar, they should see a section called Institutional Data. Administrators are able to configure what charts they want to see. The charts (or panels) will display data corresponding to the administrators highest level of permissions. For example, if the user is a departmental administrator, the data should describe their department; if a college administrator, their college, etc. Administrators will be able to filter by unit (that they have access to) and also filter by date/term. 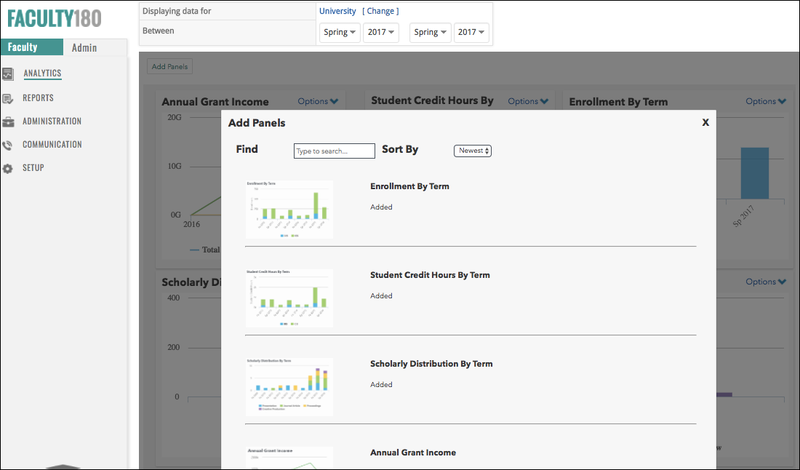 Administrators will be able to add new charts by selecting the Add Panels button. Available options are Enrollment by Term, Scholarly Distribution by Term, Student Credit Hours by Term, Annual Grant Income.